Is Mehbooba Mufti inciting terror in Kashmir in bid to preserve PDP? If Mufti sees the unravelling of her party as the handiwork of the BJP at the centre, that's a political problem she has to deal with using appropriate means. Invoking threat to national integrity and offering veiled support to the terrorists are not becoming of a leader of her stature. 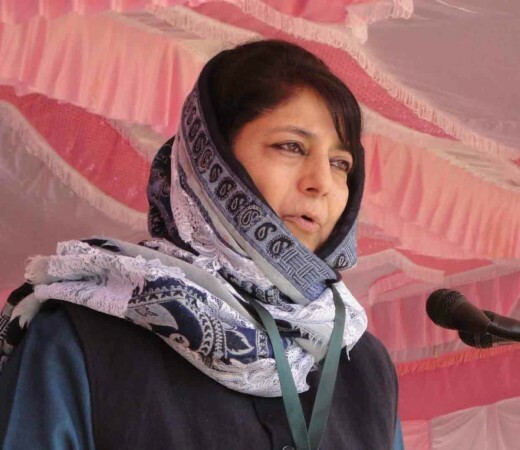 Embattled PDP leader Mehbooba Mufti used the July 13 Martyrs Day in Kashmir to unequivocally warn the central government over its alleged attempts to break up her party. However, by invoking the terror prospect, the former chief minister may have incited the separatists on an emotionally charged up day in Kashmir's history. "If Delhi tries to dismiss the voting rights of people like 1987, and if it tries to create divisions and interfere like that, then I think just like a Salahuddin and a Yasin Malik were born in 1987, there will be dangerous consequences," Mufti said. The reference to separatists like Syed Salahuddin and Yasin Malik, however, was only a thinly veiled threat that was not becoming of a chief minister who ruled the states until a month ago. National Conference leader and former CM Omar Abdullah was among the first people to denounce Mufti's comments. "She must really be desperate if she is threatening the Centre with renewed militancy if PDP breaks up. She seems to have forgotten that militancy in Kashmir has already been reborn under her most able administration," Abdulla said. What's more interesting is that Mufti aired her dire warnings against the centre after it became clear that her PDP was showing signs of disintegration. Prominent leaders and lawmakers quit the party in recent weeks after rebelling against the 'family rule' in the party. As many as 14 lawmakers have threatened to quit. Mufti's desperate bid to keep her fold united, even at the cost of letting the terror spectre raise its head again, shows that BJP's decision to quit the alliance did not come a day too late. It seems the BJP is paying the price for an alliance that could not claim any achievement in the state. On the other hand, there has been a marked deterioration in the security scenario in Jammu and Kashmir under the PDP-BJP rue.